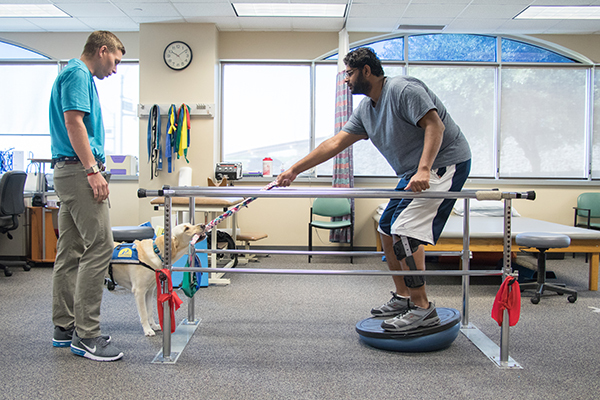 The newest addition at Baylor Institute for Rehabilitation Grapevine-Lancaster is bringing patients a unique form of treatment — the love of a dog. Canine Companions Facility Dog Karmen is a 2-year-old Labrador/Golden Retriever cross who assists in the outpatient clinic with her human handler, Travis. Travis is a physical therapist at the facility who says Karmen has completely transformed his sessions. Karmen is trained in over 40 commands that the facility dog team uses to assist in sessions. She picks up dropped items, helps with balance exercises by tugging on a rope, assists in grip strengthening and dexterity training, and helps motivate patients to go from sitting to standing by doing the movement alongside them. Karmen is helping to make physical therapy a positive experience for patients, using both her extensive training and uplifting presence. The collaboration between Baylor Scott & White Health and Canine Companions for Independence to build the South Central Region campus is the first of its kind and is allowing many dogs like Karmen to be placed with those in need in Texas. Karmen is the first dog to be placed in a Baylor Scott & White Health facility, adding a new aspect to the already successful relationship.